When staying overnight at trekking lodges, we have an early breakfast at around 8:00-9:00 so that we can resume our trek by about 10:00. Breakfast starts with a large intake of fluids. Usually this is tea which helps you to wake up and your voice to return to normal if it has become hoarse due to the overnight cold. At trekking lodges, tea is served in thermoses of various sizes (on the menu, they’re listed as Small Pot, Medium Pot and Big Pot). A Small Pot will mostly likely be a 0.5 litre thermos, while a Big Pot will be a 2 litre thermos. Generally, the size of the Pot depends on the lodge in question. In one lodge “big” will mean a 2 litre thermos, while in another it will be a 1 litre thermos with hot water. However, both have one thing in common – regardless of the size of the Pot, it will contain only one tea bag and it will only partially fit the description of tea. You can ask for an additional tea bag or best of all bring your own tea with you. Otherwise, the quality of tea will often make you nervous. Oatmeal boiled in water is usually available for breakfast, along with French toast served with jam, butter or honey. More original and tasty will be homemade bread in the form of Tibetan bread or Chapatti. Sometimes, but not always, local tsampa porridge will be available during the trek. It tastes delicious if it is well prepared. Tsampa will be available more often on the Annapurna Circuit Trek. Hashed brown eggs will also be available for breakfast, as well as omelettes, pancakes, muesli, cheese and juice from packs. When eating breakfast on the Everest Base Camp Trek, I usually prefer a generous portion of oatmeal, fried eggs and Tibetan bread. Oatmeal is healthy and replenishes your body with energy for longer and maintains a higher level of glucose in your bloodstream. Whilst trekking, ask your guide or bearer to recommend a tea house or lodge where you can have lunch and which will serve good hiking food. Until you reach an altitude of 4,000-4,500m, during your day’s you will usually encounter several settlements along the trekking route where you can have lunch. At high altitude, it will only possible to enjoy bigger meals at the final destination of the day – at the trekking lodge (Lobuche, Gokyo, Gorak Shep, Dughla and some remote settlements). The selection of meals on offer for lunch is extensive – starting from simple snacks in the form of Tibetan bread with jam right through to various soups, steaks, sandwiches, Momo, macaroni dishes and pizzas. Hiking food menu in tea houses will differ depending on the altitude reached along the trekking route. As a rule, the higher you have climbed up, the bigger the prices will and the less choice there will be on the menu. Below I’ve attached a menu which you can choose at trekking lodges along the Everest Base Camp trek. One of my favourite hiking foods are garlic soup which is a natural means of preventing altitude sickness, as well the Nepalese national food – dal bhaat or boiled rice with a specially prepared lentil soup with side dishes: vegetables, root vegetables, curry and the like. Dal Bhaat in the mountains is very nourishing; it is a light and healthy hiking food. During the 20 day Gokyo – Everest Base Camp Trek, I easily survived without any meat dishes and together with the day’s physical activity; this meant I was able to recharge my body’s batteries to great effect. Dinner is usually eaten in the trekking lodge where you are staying overnight which you will usually reach on a normal trekking day some time from 16:00 – 18:00, depending on the route plan. On the way to your destination, you will mostly make your overnight stay at a new altitude which will be higher than before and it is recommended that you start dinner by consuming a lot of fluid. Even if you don’t want to eat and have a mild headache due to the new altitude you’ve reached, it is important to eat, because this reduces the risk of contracting symptoms of altitude sickness. You can order all the same meals for dinner at a lodge that are available for lunch. There is only one menu at trekking lodges at it doesn’t change. On the Everest Base Camp Trek, together with friends we usually start dinner with a big pot of black tea and then choose one of the meals. Depending on our mood, these could be Momo, steak, dal bhaat, oatmeal, pasta or pancakes. Arriving at the trekking lodge, it is important to reserve a place at the dining table straight away, particularly in high season when there are lots of trekkers in the mountains and on routes like the Everest Base Camp Trek, Gokyo Trek and Annapurna Circuit Trek. From October – November, the mountains become dark around 17:00-18:00 (local time). The sun sets rapidly and disappears behind the mountains within about half an hour and it gets cold. Trekkers spend the time until bedtime in the dining room having dinner, drinking tea, beer and talking. At the lodge, each room has its own order notebook in which trekkers write down their order – name of the meal, quantity and price after studying the menu. The same procedure is followed next morning at breakfast, after which trekkers calculate the total amount they owe for breakfast, adding on the prices of accommodation and dinner, and pay the balance to the owner of the lodge. 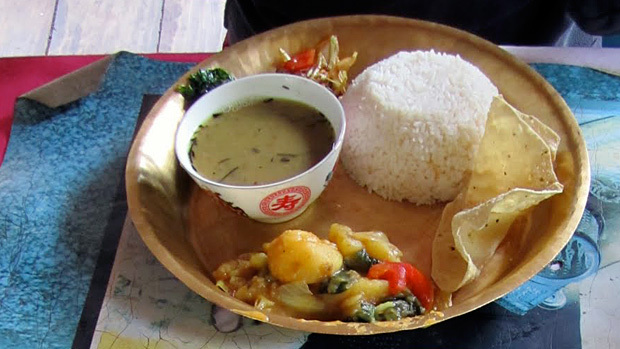 The charge for overnight accommodation at a trekking lodge is calculated symbolically: Rs 100 – 200, on condition that the trekker orders a meal from the lodge’s kitchen. If the trekker arrives with his own meal, the accommodation charge increases dramatically and can reach 1000-1200 Rs per night per person. Usually, calculating the sum in the morning for dinner, accommodation and breakfast plus drinking water for the new day, the total sum per person comes to about Rs 1,000-2,000, depending on the altitude at which you are staying. More expensive overnight accommodation and a meal will be at Gorak Shep, Gokyo, Lobuche and more remote trekking route locations at an altitude of ~ 5000 metres.